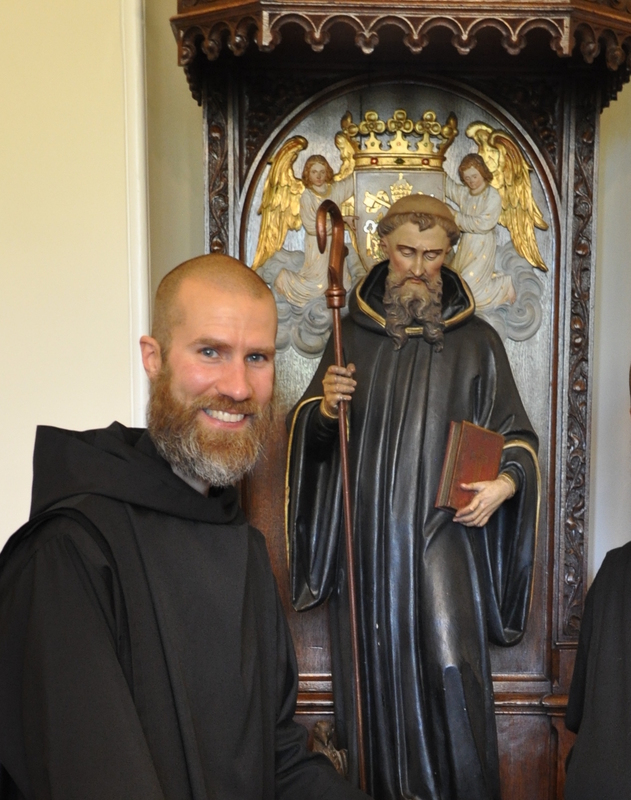 On Thursday morning, 1 November 2018, the feast of All Saints, Brother John Baptist DeCant, a native of Oregon, Ohio, pronounced his First Vows as a monk of Silverstream Priory. Born Joseph Peter DeCant, Dom John Baptist is the son of Helen Mary DeCant, of Oregon Ohio, and of the late Raymond R. DeCant. He is the brother of Janette Root, and uncle to Janette’s three children. Dom John Baptist attended Holy Rosary School in Toledo, Ohio, and Cardinal Stritch High School in Oregon, Ohio. 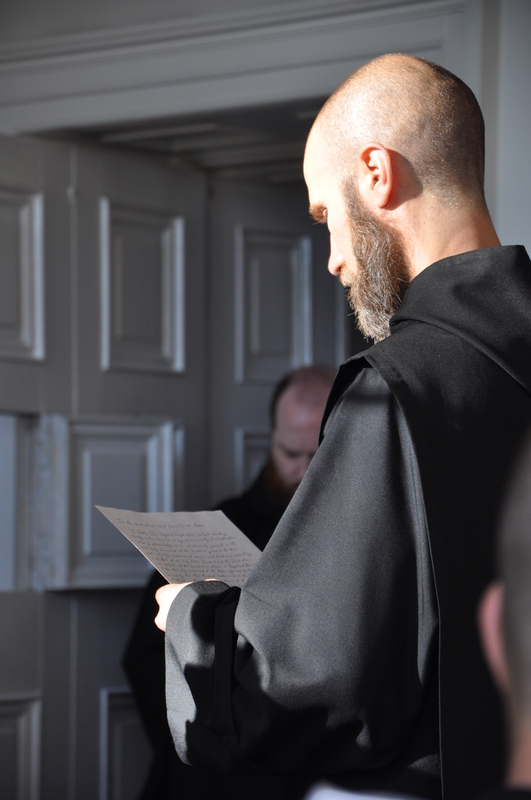 The newly professed monk holds a B.S. in Environmental Sciences from Allegheny College and an M.S. in Ecology from Colorado State University; he is also a certified Medical Emergency Technician. Prior to entering Silverstream Priory, Dom John Baptist worked for the Environmental Protection Agency in Arlington, Virginia. Apart from serving as the monastic infirmarian, Dom John Baptist supplies the monastic table with an abundance of fresh greens and vegetables from the monastery two polytunnels. He is also in charge of the monastery’s poultry and has successfully raised various breeds of chickens from the indoor stage of incubation to the free–range production of eggs. The Simple Profession of Dom John Baptist DeCant, O.S.B. You are here today, dear son, because Our Lord has fixed His gaze upon you, saying: “If thou wilt be perfect, go sell what thou hast, and give to the poor, and thou shalt have treasure in heaven: and come follow Me” (Matthew 19:21). Jesus, having looked upon you and loved you, has drawn you out of the world to abide in this His house, close to the altar where, truly present, He veils the splendour of His Face beneath the sacramental veils. In what appears to be a morsel of bread, He contains the blazing conflagration of His Heart. Your life, dear son, has been magnetised by the Most Blessed Sacrament, pulled towards Our Lord by a mysterious attraction of grace. In the sixth chapter of Saint John, the discourse on the Bread of Life, Our Lord says: “Nobody can come to Me without being attracted towards Me by the Father Who sent Me” (John 6:44). This was the work of the Father in the secret of your soul: the grace of an attraction to the Son. And the Son Himself says to you: “Yes, if only I am lifted up from the earth, I will attract all men to Myself” (John 12:32). Lifted up He was, first in the arms of His Virgin Mother, and then on the altar of the Cross. And lifted up He continues to be in the hands of His priests, in what Saint Thomas calls the sacramentum sacramentorum, the sacrament of all sacraments. It is from this Most Holy Sacrament that Jesus has, for a long time, been drawing you to Himself. It was this attraction and nothing else that brought you to Silverstream Priory. You could have gone anywhere in the world. It is in the impetus of this attraction that you will pronounce your vows today. It is this attraction that will keep you here in the cloister, where “your life is hidden away now with Christ in God” (Colossians 3:3). 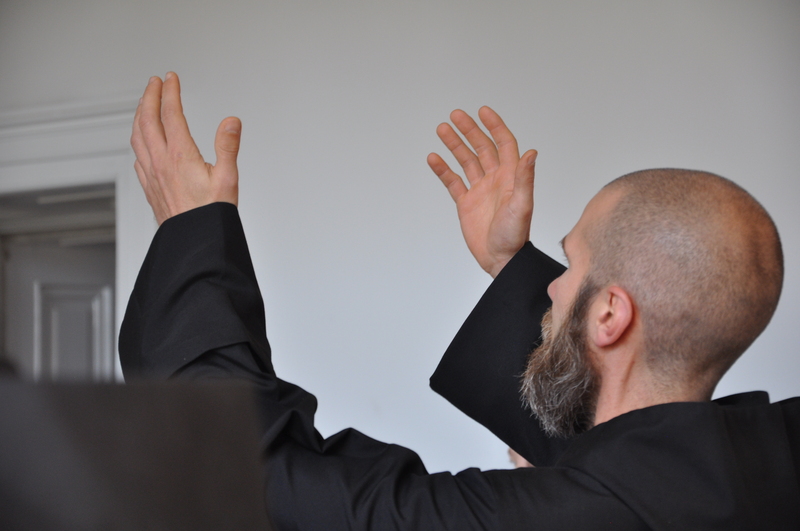 Saint Benedict says, in Chapter 58 of the Holy Rule, that in judging whether or not a man is suited for the monastic life, we are to look for one thing: si revera Deum quaerit, “whether he is truly seeking God.” Brother John Baptist, we have lived with you and you with us. And now, having come to the end of your noviciate, we have seen and we can say that you are truly seeking God. You have sought God in the splendours and obscurities of the Divine Office. You have sought Him in obedience and in humiliations. You have sought Him in the Sacred Host where He veils His Face, waiting in silence, like a humble beggar, for one to comfort Him. You have sought Him in brethren laid low by infirmity, and in them you have served Him with the most touching devotedness. You have sought Him in your work, and found Him even in the midst of your chickens, and in the woods and in the fields of this little portion of County Meath where God invites you to put down roots, becoming amator loci et fratrum, a lover of the place and of the brethren. It is quite possible that when the history of Silverstream Priory is written, 2018 will be described as a year marked by sickness, weakness, and infirmity. Saint Benedict says in Chapter 72 of the Holy Rule: “Let them most patiently endure one another’s infirmities, whether of body or of mind.” A considerable part of your noviciate, dear son, has been spent in caring for your fathers and brothers. Know this and never forget it: in caring for the injured and the sick among us, you have served the Body of Christ as truly as if you were serving at the altar. Mother Mectilde tells us that, save in the Most Holy Sacrament of the Altar, Christ is nowhere more truly present in the monastery than in the cell of a sick brother. This, I think, is one of the great lessons that you will have learned, and learned well as a novice. And the words of Our Lord Himself confirm it: “I was hungry, and you gave Me to eat; I was thirsty, and you gave Me to drink . . . naked, and you covered Me: sick, and you visited Me” (Matthew 25:35–36). I understand your point about the new monastery and the construction occurring at the present moment, and the resulting inconveniences. I believe that the sacrifice of my desires and inclinations would occur wherever I would plant my roots. That has been my experience in the past. And these are also the parts of life that lead to my sanctification. As I have learned before, these aspects of the life will be filled with struggles, but they will also not be without their joys, especially when they are shared in the community. I certainly have a desire to be a pioneer, in whatever way God would choose to put them to use. I have my training and experience to support, collaborate, encourage, and cooperate. I trust that putting these under the vow of obedience will support the Church in wonderful ways. . . . In praying about it, I have been and continue to feel more strongly inclined to contribute the gifts that God has given me to help enable a community to live out its communal desire for perpetual adoration of the Blessed Sacrament and working towards the salvation of souls. I do have the desire to worship God as He wishes. I say it again, dear son, Our Lord Himself caused you to desire what He Himself desired for you and from you. “For the Father also seeketh such to adore him” (John 4:23). Suscipe me, Domine. Take Thou me unto Thyself, O Lord. Thou seest that I am poor: Take Thou me unto Thyself, O Lord. Thou seest that I have nothing: Take Thou me unto Thyself, O Lord. Thou seest that I depend on Thee for everything: Take Thou me unto Thyself, O Lord. God bless you abundantly, Brother John Baptist, and greetings from Oregon, Ohio.